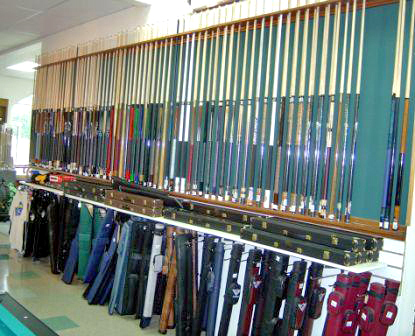 A view of over 130 two-piece personal cues and over 100 cue cases. There is a very wide variety of qualities in billiard equipment, and the cheapest version is rarely the cheapest in the long run. Good cues and balls will affect your game the most -the quality of the triangle won’t make a difference at all. A table cover and a good horsehair brush will help keep your cloth in good playing condition – but only if you use them! If you use a wall rack to hold your cues, remember to use an interior wall. The temperature differences in an exterior wall will tend to warp the cues. A floor rack is a bit less stable than a wall rack, as it only supports the cue in one place. However if you do not have an interior wall available, that could be the best solution. Billiard lighting is not just for looks – though a nice lamp can affect the entire room’s atmosphere more than even the table; because the lamp is at eye level, and the table is not. Billiard lamps are designed to cast an even, shadow-free light over the entire playing surface; using incandescent bulbs. Ceiling-mounted incandescent lighting usually casts shadows when the player leans over the table, because it’s over the player’s head. Fluorescent lighting doesn’t cast much of a shadow, but the minute vibration in the light sometimes throws off the player’s concentration. Spectator’s chairs make an important contribution to a billiard room. Their arms are designed to hold a drink, and have a notch to hold the cue safely. The chair’s height is about the same as a standard bar stool and you can use a spectator’s chair near a bar. However, when used as intended, the spectator’s chair would face away from the bar, and towards the action on the table: that’s why there is a drink holder on the arm. The chair’s seat height is the same as a regulation pool table’s slate, so that you can see all of the action while seated. It’s also much easier on the knees to get up and down from a spectator chair than a lower dining chair for every shot. Possibly most important, though, is the psychological use for a spectator’s chair. It’s designed for you to half-sit, almost lean on, if you wish. That is why they normally do not swivel. Why? If you sit back comfortably on it you’re telling your opponent that you expect him or her to be playing for a while before it’s your turn again. If you just sort of sit or lean on it, it tells your opponent that you expect him or her to blow the next shot and let you back at the table! Pool is, after all, more of a mental game than a physical game.